Based on our proven learning strategy of prepare, practice, and perform, the Level III SchweserNotes™ Package is a key component to a successful CFA® exam study program. Our basic study package combines candidates’ favorite study tool, SchweserNotes™, with three full-length practice exams and the go-anywhere QuickSheet. Connect with expert CFA instructors and use your Study Calendar to create a detailed study plan. 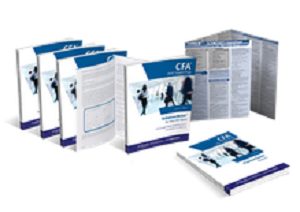 The 5-volume SchweserNotes™ is the key component as you prepare for the CFA® exam. They provide clear, concise study notes and examples that cover every Learning Outcome Statement. Measure your progress with practice questions and realistic self-tests at the end of each topic. Prepare for the CFA exam on the go! This compact study tool summarizes key formulas, definitions, and concepts. Once you know the concepts, apply the material with 3 full-length practice exams. Identify your problem areas, master the material, and gain the confidence you need to perform your best on the actual CFA exam. Included with your Practice Exam is access to the Online Performance Tracker, which allows you to compare your scores to other candidates. Connect with a CFA expert during designated office hours to get your exam- and content-related questions answered.